Oil prices have surged on hopes of a freeze in global production. But a more hidden factor is also fueling the price spike: terror attacks on oil facilities. Sabotage to key oil pipelines have driven global supply outages to "elevated" levels estimated at more than 3 million barrels per day, according to the Royal Bank of Canada. For instance, last month a critical pipeline in Nigeria was bombed, taking around 250,000 barrels of crude offline until May. Extremist groups pose a "clear and present danger" to energy facilities, especially those in oil-rich North Africa, RBC wrote in a recent research report. Oil prices have rallied recently to around $40 today from $26 a barrel in mid-February. The sharp rise has been largely attributed to an effort to "freeze" oil output by Saudi Arabia, Russia and other producers. Investors are also betting U.S. production will decline sharply in 2016. But geopolitical jitters and supply outages are also playing an important role. That's a change from much of the past two years when these concerns were overshadowed by the epic supply glut and Iran's efforts to ramp up production. "OPEC outages in hotspots like those recently seen in Iraq and Nigeria are a good reminder of how quickly volumes can be sidelined," RBC wrote. "As the market gradually tightens, we think these hotspots will return to center stage." Earlier this month the International Energy Agency pointed out that oil prices have "recovered remarkably" in part due to supply outages at OPEC nations Iraq, and Nigeria. The outages in Iraq and Nigeria alone have knocked offline about 850,000 barrels of exports, the IEA estimated. Of course, ISIS stands to gain from supply outages that lift oil prices because the terror group makes money selling oil. However, U.S.-led military strikes on ISIS oil facilities have also hurt the group's oil production in recent months. Nigeria: Last month an explosion on an underwater pipeline operated by Royal Dutch Shell in Nigeria caused a major disruption that could last until May. The IEA estimates some 250,000 barrels of oil per day have been disrupted. It's not clear what caused the explosion and Shell did not respond to a request for comment. Authorities suspect a sophisticated attack by militants who deployed divers, the Financial Times reported. "The people who did this knew what they were doing and they wanted maximum damage," a source told the FT.
Iraq: Iraq's semi-autonomous Kurdistan region suffered a big blow last month after security worries shut down a key pipeline that transports 600,000 barrels of oil per day. The pipeline has been "regularly sabotaged" on the Turkish side of the border since last summer, RBC said. Kurdish export revenue plunged to $233 million in February from $650 million in January, according to the IEA. And oil production overall has declined by as much as 320,000 barrels per day in February in Iraq as the country struggles to fight off attacks from ISIS. While Iraq's oil production remains near all-time highs, analysts warn its facilities are at risk of further attacks from terrorists. 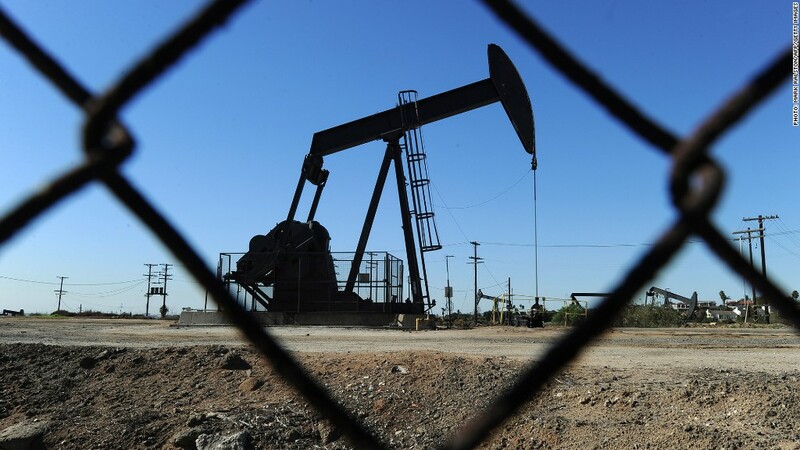 Algeria: A natural gas field and processing plant at Krechba, Algeria suffered a rocket attack on March 18. RBC said the attack was executed by a local Al Qaeda affiliate. While operations were not impacted, the attack forced BP and Norway's Statoil to evacuate employees. Algeria, the largest gas producer in Africa and a top three oil producer on the continent, was also the site of a 2013 Al Qaeda assault that killed dozens of foreign workers. Libya: In February Libya pumped just 360,000 barrels per day, according to the IEA. That's a one-year low and just a "small fraction" of the 1.6 million barrels it produced a day before Muammar Gadhafi was overthrown in 2011. Militants linked to ISIS escalated attacks on Libya's oil sector at the start of the year, striking vital ports at Es Sider and Ras Lanuf, the IEA said. Just two of the country's seven onshore loading terminals are operational. --CNNMoney's Alanna Petroff and Ivana Kottasova contributed to this report.